It is 1962 in New Zealand. Burt Munro (Anthony Hopkins) is looking for something to punctuate his life. He’s been tinkering with his motorcycle for thirty years wants to race it at the Bonneville Salt Flats, just to see how fast she can really go. The rest of the movie is details. These involve Hopkins facing one minor crisis after another as he inches his way closer to Utah from all the way around the world. None of the crises amount to much. Donaldson manages to create some tension from them (Will his bike survive the sea voyage? Will his health give out? Will he be allowed to race?). But really, Burt’s story seems to be not nearly as interesting or eventful as a feature film demands. Giving the movie the benefit of the doubt, we can ask if maybe the point is not the drama, but the characters or the settings or the style. But one look at these and you realize they aren’t the point, either. Even Hopkins is unable to raise this movie above its plot. He plays his usual self, looking wistfully into the distance, his eyes tearing up, as he reminisces about the old days, as he does in so many of his recent films. 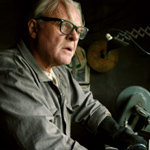 Of course, he’s great at it — he’s Anthony Hopkins — but it’s all he — and this movie — have to offer, and it’s not enough. some people have a lot ,but do very little with their lives. greatness in those who think they have less than those around them .